It is well known that the share of women in the teaching force is growing. According to the latest Education Indicators in Focus brief, the average share of female teachers across OECD countries increased from 61% in 2005 to 65% in 2010 and to 68% in 2014, in all education levels combined. Around 82% of primary school teachers and 63% of secondary school teachers are women. Some policy makers see this trend as a cause for concern, citing, among other things, that the lack of male teachers and role models might play a role in the decline of learning outcomes among young boys. But it seems fair to say that few people would be concerned about a similarly skewed gender imbalance in other professions if it benefited men. The statistics on the age distribution of male and female teachers show that the gender imbalance in the teaching profession will increase even more in the years to come. At the lower secondary level, women make up 70% of teachers under the age of 30, while they account for 65% of those aged 50 and over. This pattern is observed in 22 out of 35 countries with available data. The larger proportion of women among young teachers raises concerns about future gender imbalances at the lower levels of education, where women already dominate the profession. Gender imbalances among teachers have a lot to do with gender stereotyping, and the power and prestige connected with certain occupations within the profession. This is seen in the smaller shares of female teachers in the higher levels of education, in (perceived) more prestigious fields of study and in leadership positions. Women fill only 43% of the jobs in tertiary education. In secondary school, women are less frequently found teaching science, mathematics and technology classes. And, on average across OECD countries, 68% of lower secondary teachers are women, but only 45% are principals. This is particularly striking given that principals tend to be recruited from among the ranks of teachers – suggesting that female teachers are less likely to be promoted to principal than their male counterparts. So, the large share of women in the teaching profession is, itself, skewed towards specific jobs: those at the bottom of the education pyramid and the bottom of the hierarchy of power. So why, then, do so many women want to become teachers? Gender imbalances in teaching are the result of women’s conscious and strategic choices as much as of labour market conditions, social norms and cultural messages. In many countries, women’s increased participation in the labour market coincided with the need for more trained teachers in expanding education systems. Countries where female labour participation in general is low, like Japan, also have the smallest shares of female teachers. In addition, stereotypical views of teaching as a profession that, at times, resembles parenting, probably play a role, especially with younger generations of women who apparently value motherhood more than their own baby boom mothers did. Labour provisions that allow teachers to work part time and to flexibly combine work, family life and the care of one’s own children also seem to be more appealing to women. But less well-known is that the salaries of teachers, as measured against the average wages of other tertiary-educated workers, are much more attractive for women than for men. 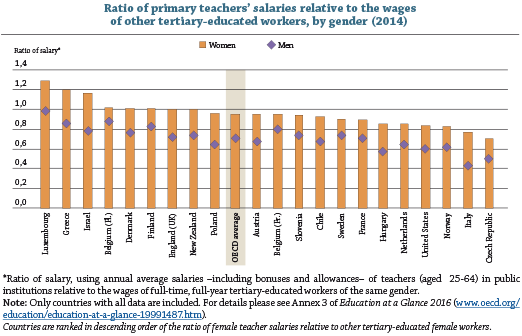 As shown in the chart above, on average across OECD countries, male primary school teachers earn 71% of the wages of other tertiary-educated men. But female teachers earn a significantly higher relative wage. Women in primary education earn over 90% of the salaries of other tertiary-educated female workers. While men and women doing the same teaching job in public schools earn nearly the same, the relative value of their earnings in the professional labour market is strikingly different. This is probably why more women are interested in teaching, especially at the lower levels of education. Paradoxically, introducing a greater gender balance into the teaching profession depends on the extent to which and the speed with which other sectors reduce gender gaps in earnings. But the education sector could do much more to ensure that women are promoted into leadership positions, and to end the stereotyping that prevents women from breaking the glass ceiling in specific subject areas and in universities. It could also do more to attract young men into teaching by offering them better career prospects and labour conditions that can make teaching a more competitive career choice, even if teachers’ salaries still lag behind those of other professionals.